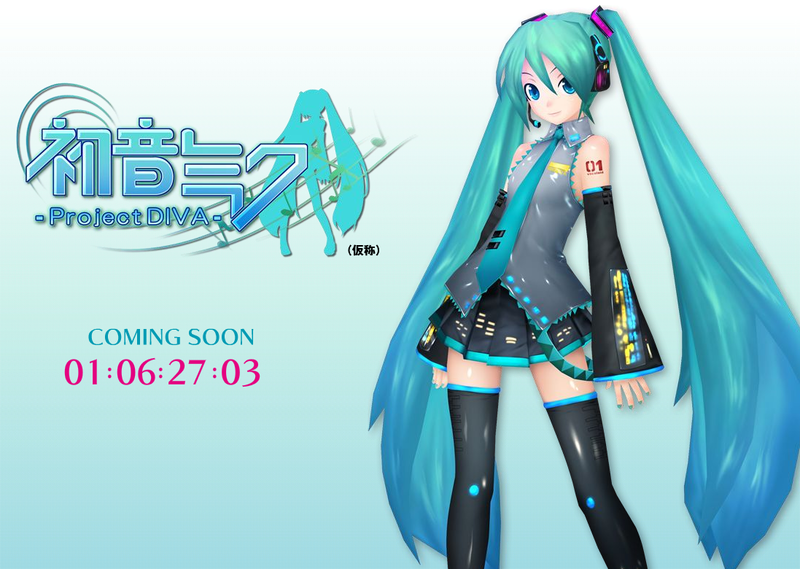 Hatsune Miku Project DIVA website opening soon! Coming Soon… Soon as in 1 DAY!! SEGA has begun a collaboration of PIAPRO, so we’ll see more updates on this game from the PIAPRO development blog. So this is what Kuri☆Ken is hiding… Anyway, it looks like the game is confirmed to be a Rhytm game… And there’s this SEGA x PIAPRO collaboration. Let me repeat that again. A rhytm game, and a SEGA x PIAPRO collaboration. What does this mean? THERE WILL BE SONGS IN THE GAME FROM THE COMMUNITY AT PIAPRO!! And of course, illustrations from there would also be used for accessories, and “wallpaper”. Full details would be revealed once I get a hold of the Famitsu article or once the website opens (maybe tomorrow). Yes, I would not sleep and wait for the countdown of the website to finish and then I’ll blog about it (and the Hatsune Miku’s birthday too). So see you tomorrow for the full details! Aw. I haven’t put anything on Piapro yet..
is it availible in english?